For example how alternating currents are affected with you add capacitors, resistors or an inductors. I mainly want to introduce the elements we will need to understand tuned circuits and resonance (like in your radio). We will look much more closely at resonance in a later video (one of the MAIN ideas in this video series with HUGE implications for how PEMF helps to energize the cells). Frequency resonance along with Induction I feel are the TWO MAIN keys to how PEMF devices create positive biological effects. 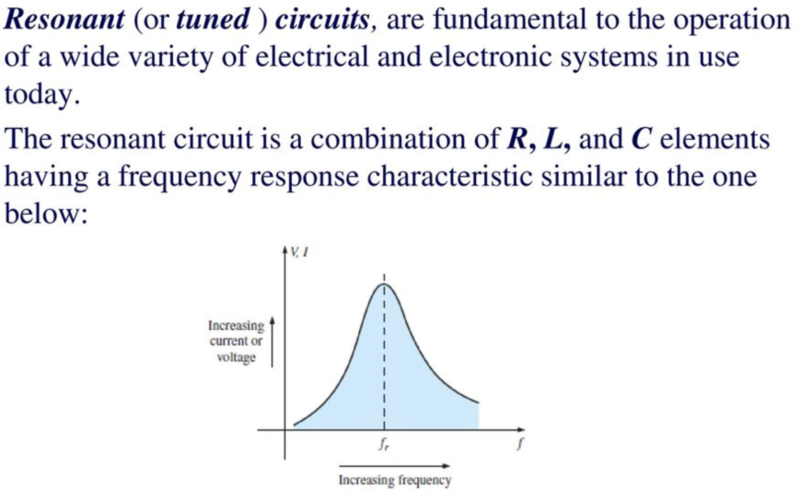 Unlike a resitive circuit the current is frequency dependent. L and C neutralize each other at the resonant frequency. If you want only your favorite radio station, go to the electronics store and buy an LCR circuit with L and C chosen so that f = f. Old fashion dials on . aradio were a variable capacitor. The Most Remarkable Example Of Resonance! Resonance is a fantastic subject. 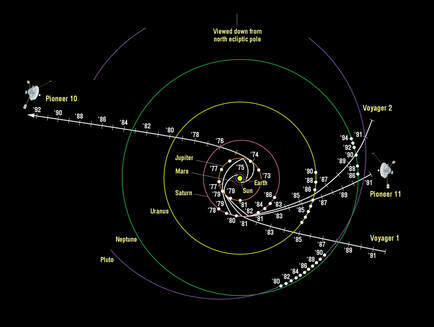 In 1983, Pioneer 10 left our solar system. On the 30th anniversary of its launch, NASA sent a message to Pioneer, which was then 7.4 billion miles away. A response was received 22 hours and six minutes later. Pioneer's last, very weak signal was received on 23 January 2003, when it was 7.6 billion miles away. Two kinds of light... Speed of light and the other is faster. Sends a pilot wave... signal is coming. Quantum entanglement. 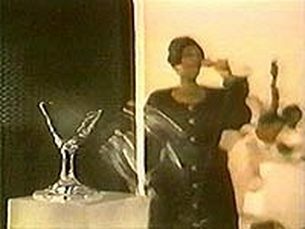 Ella Fitzgerald Shattering a Crystal Wine Glass with her voice is an example of resonance. ​In physics, resonance is a phenomenon in which a vibrating system or external force drives another system to oscillate with greater amplitude at specific frequencies. Frequencies at which the response amplitude is a relative maximum are known as the system's resonant frequencies or resonance frequencies. 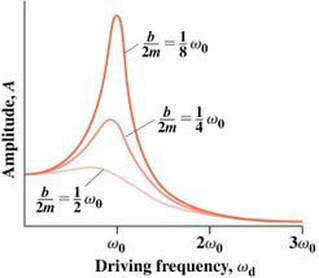 At resonant frequencies, small periodic driving forces have the ability to produce large amplitude oscillations, due to the storage of vibrational energy. Any physical object has frequencies at which they naturally vibrate, known as resonance frequencies. If you flick a crystal wine glass with your finger, you will hear a fairly clear tone as the glass vibrates, causing waves of air pressure to emanate out from it, which your ears and brain interpret as sound. The sound gradually gets quitter and dies out as the amplitude of the vibrations diminishes due to energy being carried away by the sound waves. Making a wine glass sing or shatter. 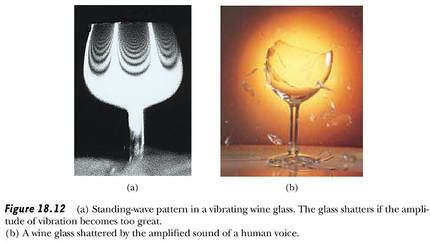 Frequency resonance can make a wine glass SING or SHATTER. What makes it shatter is HIGH intensity (the amplitude of the vibration becomes too great). Low frequency low intensity PEMF devices resonant with your cells to make them SING a song of health. High intensity PEMF can have short term symptomatic benefits but at a long term can shatter your health. When you use the right frequency, all you need is a little vibration to make your cells sing! Frequency resonance is the KEY NOT INTENSITY! A familiar example of resonance is a playground swing, which acts as a pendulum. 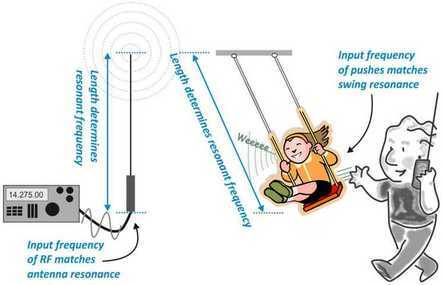 Pushing a person in a swing in time with the natural interval of the swing (its resonant frequency) makes the swing go higher and higher (maximum amplitude), while attempts to push the swing at a faster or slower tempo produce smaller arcs. This is because the energy the swing absorbs is maximized when the pushes match the swing's natural oscillations. Resonance in circuits are used for both transmitting and receiving wireless communications such as television, cell phones and radio. Perhaps something is resonating with something else. ***Now lets go back to AC circuits and combine an inductor, a capacitor and a resistor all into one circuit. As you are aware, inductors convert one form of energy (current flow) into another (magnetic force) and then restore it to its original form. In AC circuits an inductor bucks the instantaneous flow of electrons and appears to be an impedance to alternating current flow with the impedance increasing with the increasing frequency of the AC. Interestly, inductors and capacitors do not dissipate heat, only resistors do (or the wire used). But they do have voltage drops across each component and these voltage drops still affect how the circuit can supply voltage to other components, but in Capacitors and Inductors the voltage is STORED energy. We know that when a magnetic field is changing, we can induce a magnetic flux in the coil. And that flux seeks to oppose the current with an electromotive force or emf in the opposite direction. This is Lenz's law as we saw in a previous video. And this relationship works in the opposite direction as well with a changing magnetic flux inducing an emf that opposes the flux. In an AC circuit what you end up with is a changing changing current that induces an opposing magnetic flux which in turn induces an emf in the opposite direction of the current. This induction of an emf that opposes the current is called self inductance. L is a constant know as the inductance signifying how when a specific coil induces an opposing current depending on its shape and size. It is negative because the induced emf is in the opposite direction of the main current. 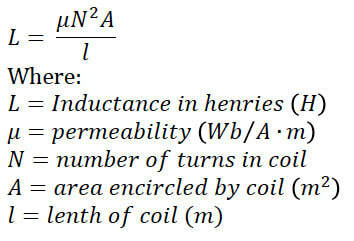 Inductance is expressed in units called Henry's. Induction of an electromagnetic force is so useful that engineers make coils that are designed to maximize their self inductance. Inductance is a property of all circuits that opposes changes in current flow. It's measured in units called Henry's. When the effects of inductance are talked about in circuits another term is used, called inductive reactance. Inductive reactive is a measure of the opposition to current flow that is created by inductance. Because inductive reactance, like resistance, limits current flow, it is measured in ohms. In order to understand how inductive reactive limits current flow, it is first important to understand a process called self induction. The induction of voltage in a conductor by AC current flowing through that conductor. ​When voltage is applied to the conductor, current starts flowing through it. The current flow causes a magnetic field to build up around the conductor. The magnetic field that builds up starts at the center of the conductor and then moves outward. The magnetic field continues to expand until the current that produces it reaches its peak value. Now while the magnetic field is building up there is relative motion between it and the conductor because the field itself is moving. Whenever there is relative motion between a magnetic field and a conductor voltage is induced. In this case a current carrying conductor is inducing voltage in itself. So we call the process self induction. As the magnetic field builds up the voltage induced is opposite in polarity to the applied voltage. This induced voltage can be called counter voltage (or CEMF counter electromotive force or back EMF - Opposes Applied Voltage). Lets see how inductive reactance can be increased by coiling a conductor. A straight conductor is only cut once by its magnetic field when a magnetic field changes. But with a coil as you can see, the magnetic field developed by each turn, cuts across almost every other turn as the magnetic field. The more turns in the coil there are, the higher the inductive reactive will be. The inductive reactance that a coil provides can be further increased by placing an iron core inside the coil. The iron core concentrates and directs the magnetic field that the coil produces. Now because the inductive reactance limits current, when you change the inductive reactance you are also changing current. Increasing inductive reactance decreases current and decreasing the inductive reactance increases current. 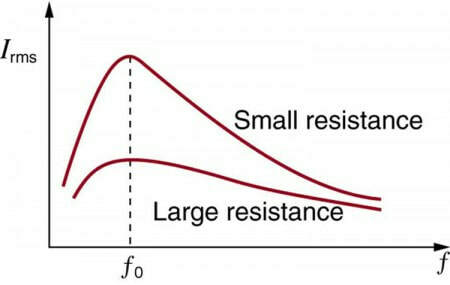 Inductive reactance is a measure of the current limiting effects of inductance in a circuit. A changing current not only induces an emf in any nearby loop, it also induces an emf in the source loop itself. And once again the field (and therefore the flux) is proportional to the current. 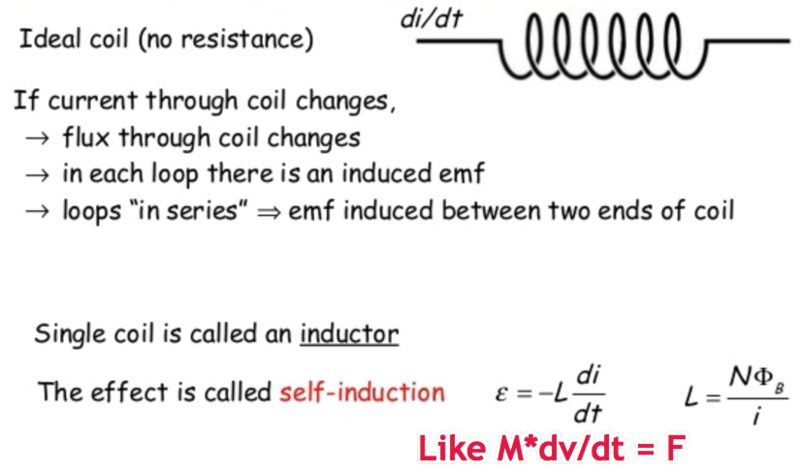 The EMF is the rate of change of flux linking with the coil due to its own current. Inductance is an intrinsically positive quantity. Lenz's law which is enforced by the minus sign dictates that the emf is in such a direction as to oppose any change in current. For this reason it is called a BACK EMF. Whenever you try to alter the current in a wire, you must fight against this back EMF. Inductance plays a similar role in electric circuits as mass plays in mechanical systems. The LARGER THE L (Inductance) is, the harder it is to change the current (electric energy), just as the larger the mass, the harder it is to change an objects velocity (kinetic energy). Also the Larger the L, the MORE energy there is in the field surrounding the coils. iMRS 2000 coils and probe have MAXIMAL N (number of turns) per unit Length because they are TIGHTLY wound. To create a larger L with Coils in a PEMF mat means to make the coils MORE tightly wound, more turns and larger diameter. For a given current, the iMRS 2000 coils will have MORE inductance than Bemer which means MORE energy in the magnetic field. The minus sign is an expression of Lenz’s law, indicating that emf opposes the change in current. Units of self-inductance are henries (H) just as for mutual inductance. The larger the self-inductance L of a device, the greater its opposition to any change in current through it. For example, a large coil with many turns and an iron core has a large L and will not allow current to change quickly. So it takes ENERGY to set up a magnetic field even though magnetic fields do not work. BUT changing magnetic fields induces Electric fields WHICH DO WORK. So take a current from ZERO to the final current is taking the Magnetic field from Zero to the final Field level ... It is this CHANGE in current (or Change in B) that does work in the form a changing electric field. These coils that are designed for self inductance are called inductors and in a circuit diagram they look like small coils because the is pretty much what they are. Steady state... Current doesn't drop immediately... Sparks from a wall. So inductors oppose a change in current whether it is an increase or a decrease. When you switch a device on or off, and notice a delay, that is probably because there is an inductor in the system. 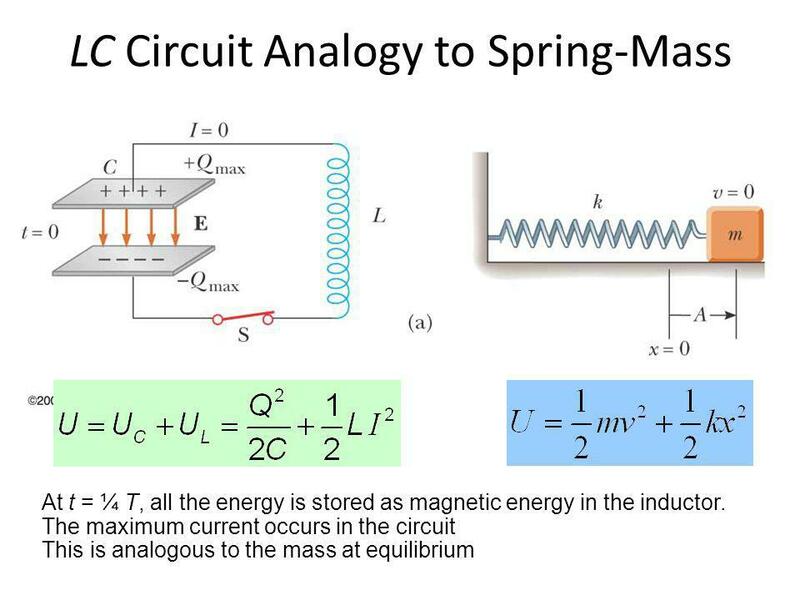 We saw how inductance limits current flow in AC circuits and we discussed inductive reactance. And we also examined factors that affect inductive reactance (coils and iron core) and the relationship because inductance current and voltage. Capacitance is a physical property of all circuits that opposes a change in voltage and is measured in Farads. Capacitive Reactance is a measure of the opposition to current flow that is created by capacitance (ohms). Capacitance is often added to circuits and power systems to counter the effects of inductance. 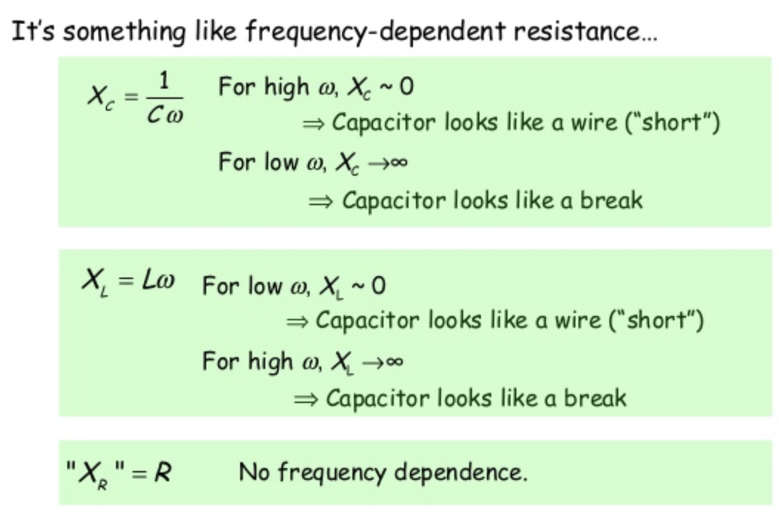 Inductance is a physical property of all circuits that opposes changes in current. 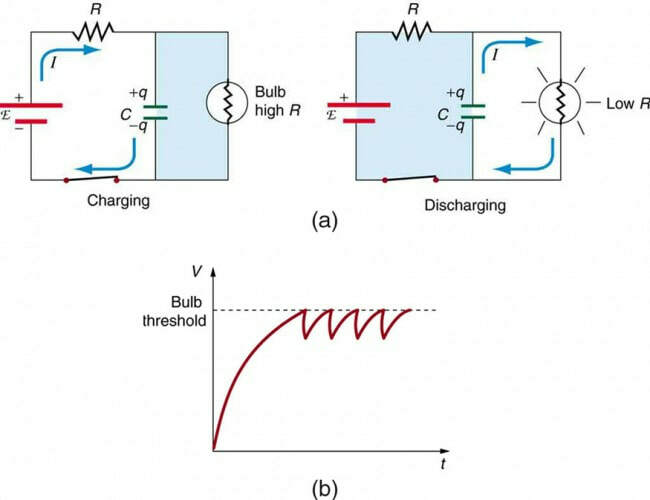 When the inductance in a circuit limits current flow more than the desirable amount, additional capacitance can be added to bring current flow up to the level that is needed. A capacitor is a device that stores energy. A typical capacitor is made up of two plates separated by an insulator or dielectric. Its purpose is to prevent the flow of electrons or current from moving from one plate of the capacitor to the other. The dielectric can be made of any good insulating material including air. Before a capacitor can store energy, it has to have energy supplied to it. The process of supplying energy to the capacitor is called charging the capacitor. To begin with, the capacitors plates are electrically neutral. Each plate contains both positive and negative charges. When the capacitor is connected to a power source and When the power source is turned on, electrons flow onto one of the capacitors plates. Because the plates are separated by a dielectric, current does not flow through the capacitor. Because the dielectric blocks the flow of electrons, the first plate has an excess of electrons, so the plate has a negative charge. Because like charges repel the second plate pushes electrons off and it becomes positively charged and the electrons flow back to the power source. For any given voltage it takes a specific number of electrons to fill the negative plate, and that number is called the capacity of the capacitor or simply the capacitance. If too much voltage is supplied to the capacitor too many electrons will be forced onto the negative plate. As a result, the dielectric material could break down. If that happens , current can flow through the capacitor from one plate to the other. In most cases, current flowing through the capacitor will destroy the capacitor. Current and Voltage are out of Phase - Current related to L and Voltage to C.
Impedance Z, Analogous to Resistance R.
When alone in an AC circuit, inductors, capacitors, and resistors all impede current. How do they behave when all three occur together? Interestingly, their individual resistances in ohms do not simply add. Because inductors and capacitors behave in opposite ways, they partially to totally cancel each other’s effect. Figure 1 shows an RLC series circuit with an AC voltage source, the behavior of which is the subject of this section. 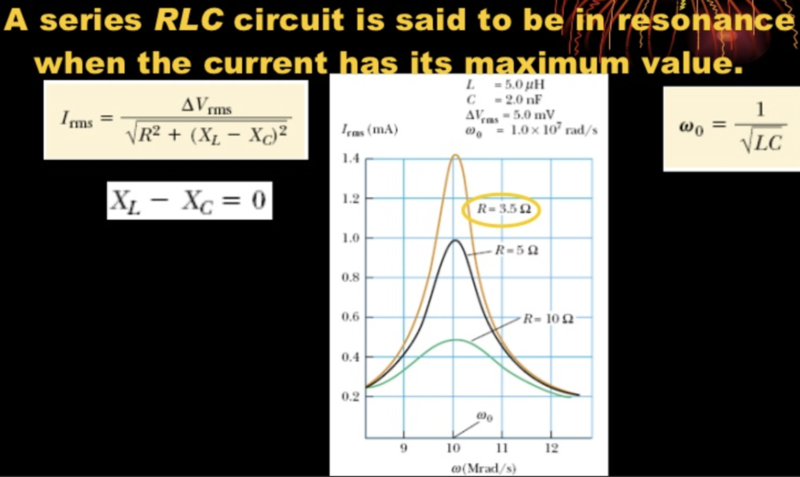 The crux of the analysis of an RLC circuit is the frequency dependence of XL and XC, and the effect they have on the phase of voltage versus current (established in the preceding section). These give rise to the frequency dependence of the circuit, with important “resonance” features that are the basis of many applications, such as radio tuners. The units of impedance are ohms, and its effect on the circuit is as you might expect: the greater the impedance, the smaller the current. To get an expression for Z in terms of R , XL, and XC, we will now examine how the voltages across the various components are related to the source voltage. Discuss the Very Important Idea of Impedance In Energy Medicine (frequency dependent resistance). The reactances vary with frequency, with XL large at high frequencies and XC large at low frequencies. 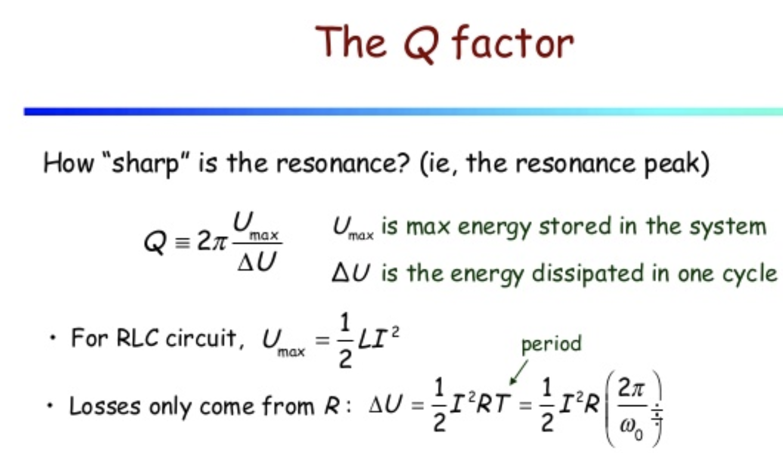 At some intermediate frequency w0, the reactances will be equal and cancel, giving Z = R — this is a minimum value for impedance, and a maximum value for Irms results which IS the resonant frequency of the LCR Circuit!! At this point w=wo is the resonant frequency of an RLC series circuit. This is also the natural frequency at which the circuit would oscillate if not driven by the voltage source. At w0, the effects of the inductor and capacitor cancel, so that Z = R, and Irms is a maximum. Resonance in AC circuits is analogous to mechanical resonance, where resonance is defined to be a forced oscillation—in this case, forced by the voltage source—at the natural frequency of the system. The receiver in a radio is an RLC circuit that oscillates best at its w0. A variable capacitor is often used to adjust w0 to receive a desired frequency and to reject others. 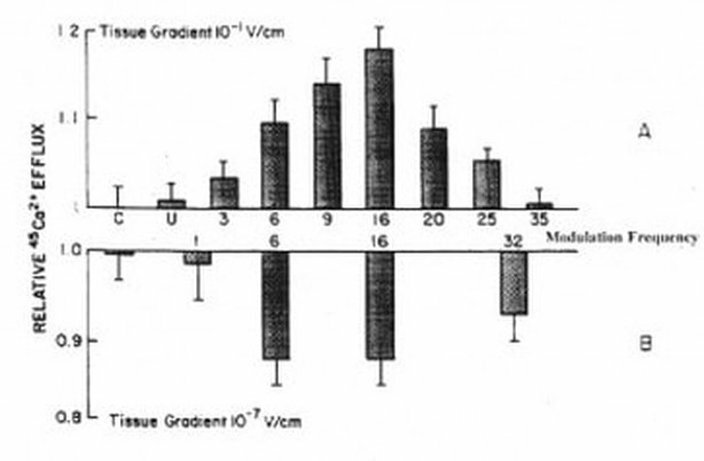 The figure below is a graph of current as a function of frequency, illustrating a resonant peak in Irms at w0. The two curves are for two different circuits, which differ only in the amount of resistance in them. The peak is lower and broader for the higher-resistance circuit. Thus the higher-resistance circuit does not resonate as strongly and would not be as selective in a radio receiver, for example. Magnetic Resonance Stimulation uses a low energy pulsed magnetic field applied to the body with an applicator. When the frequencies match (or a sub-harmonic) the resulting resonance and enhanced Q-factor stimulate energy transfer. 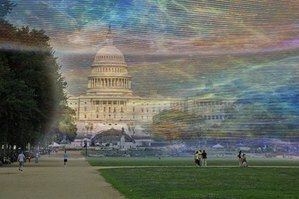 Frequencies by themselves do nothing, we need frequencies that RESONATE or VIBRATE IN STEP with the frequencies that our cells, tissues , organs, brain and biology vibrate at. Radio transmitter and receiver analogy - In the macroscopic world certain amount of intensity is needed, like if you want to tune your radio to a local radio station. But as long as you are in range, it is all about frequency resonance. Consider how your radio plucks out one station of hundreds in the air. it is frequency. And your signal will be just as strong as someone close to the tower! Again proving frequency resonance is what is needed most. Yes if you leave town you lose the signal, so intensity is important. All the low intensity PEMF devices I have measure have MORE than enough intensity to go all the way through and a couple feet above and to the other side. That is, you are well within range to "receive the signal". If you were not laying on the mat, but standing ten feet away that WOULD be analogous to leaving town and loosing reception to your favorite station. So you do have to lay on the mat and put the applicators on the spot. BUT, the intensity is more than enough, so frequency resonance will take over. Make sense? Resonance is needed for the transfer of energy and information and intensity is secondary (but important... but you just need a enough to "reach" you). Earth based PEMF devices like the iMRS 2000 produce a low energy magnetic wave which can be applied to the body or the anatomical region requiring relief. 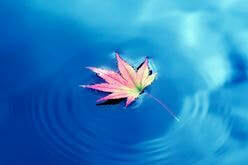 When the frequencies match, the resulting resonance (or "vibrational match") stimulates energy flow. Like the ripples in a pond cause a floating leaf to bob up and down, the magnetic waves gently rock, cleanse and soothe the tissue matrix. I get feedback all the time from people who often fall in to a deep sleep during sessions as a result of this gentle phenomenon - perhaps reminiscent of a mother gently rocking her baby! It produces a rhythmic magnetic wave whose peak value is only 70µT. Although the peak magnetic field is very small, the key to its success is resonance and repetition! For comparison, the magnetic field used in Magnetic Resonance Imaging is much higher: typically about 1T, or 1.5T, 3T, or even higher. The strength of the field used in Magnetic Resonance Stimulation is a few millionth of what is used in MRI, or approximately that of the earth's magnetic field. At the level of tissues, the same 0-50 Hz frequency range has been shown to have the most positive benefits on the human body. 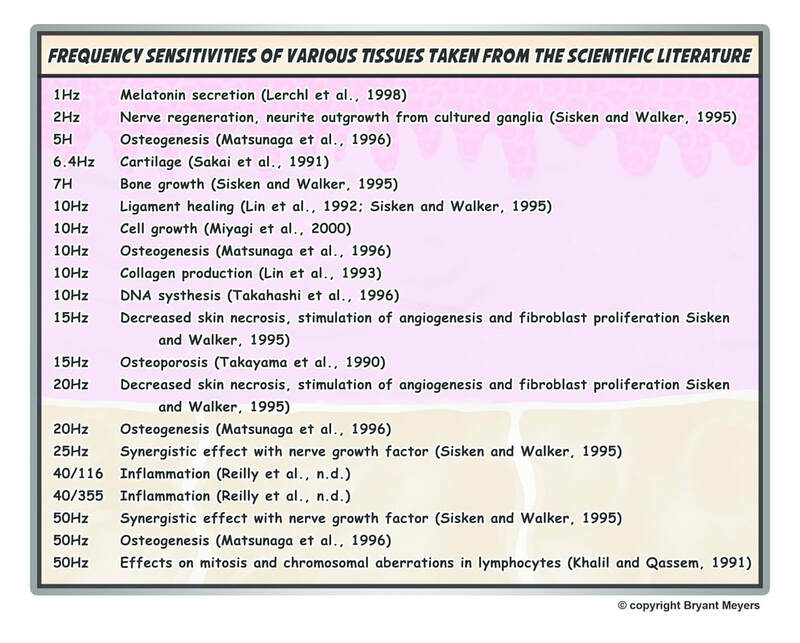 The Table to the left lists frequencies in the 0-50 Hz that biomedical researchers are finding that are effective for jump starting healing in a variety of soft and hard tissues. As a sidenote entrainment is a practical application of frequency resonance that helps the brain and body to synchronize with PEMF signals that are say energizing in the morning (beta 15-30 Hz) or relaxing or sleep inducing at night (theta / delta 0-7 Hz). This resonance or entrainment can be very helpful to relax a stressed body or induce sleep in an insomniac (The brain operates over the entire spectrum of 0-50 Hz earth frequencies). An RC circuit is one containing a resistor R and a capacitor C. The capacitor is an electrical component that stores electric charge. An circuit with an initially uncharged capacitor. Current flows in the direction shown (opposite of electron flow) as soon as the switch is closed. Closing the switch discharges the capacitor C through the resistor R. Mutual repulsion of like charges on each plate drives the current. (b) A graph of voltage across the capacitor versus time, with V = V0 at t = 0. The voltage decreases exponentially, falling a fixed fraction of the way to zero in each subsequent time constant τ. The flash discharge is through a low-resistance ionized gas in the flash tube and proceeds very rapidly. Flash photographs, such as in Figure 3, can capture a brief instant of a rapid motion because the flash can be less than a microsecond in duration. Such flashes can be made extremely intense. During World War II, nighttime reconnaissance photographs were made from the air with a single flash illuminating more than a square kilometer of enemy territory. The brevity of the flash eliminated blurring due to the surveillance aircraft’s motion. Today, an important use of intense flash lamps is to pump energy into a laser. The short intense flash can rapidly energize a laser and allow it to reemit the energy in another form. RC circuits are commonly used for timing purposes. A more crucial use of RC circuits for timing purposes is in the artificial pacemaker, used to control heart rate. The heart rate is normally controlled by electrical signals generated by the sino-atrial (SA) node, which is on the wall of the right atrium chamber. This causes the muscles to contract and pump blood. Sometimes the heart rhythm is abnormal and the heartbeat is too high or too low. The artificial pacemaker is inserted near the heart to provide electrical signals to the heart when needed with the appropriate time constant. Pacemakers have sensors that detect body motion and breathing to increase the heart rate during exercise to meet the body’s increased needs for blood and oxygen.